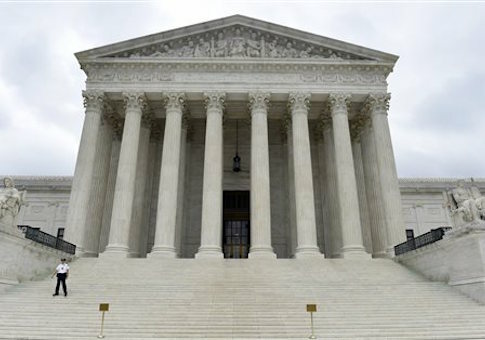 The Supreme Court on Thursday upheld an affirmative action program at the University of Texas that takes an applicant’s race into account when considering college admission. The court ruled 4-3 in favor of the race-based program, with Justice Anthony Kennedy writing the majority opinion, joined by Justices Ruth Bader Ginsburg, Stephen Breyer, and Sonia Sotomayor. Chief Justice John Roberts and Justices Clarence Thomas and Samuel Alito dissented. Justice Elena Kagan recused herself because of prior work she did on the case as United States solicitor general. The University of Texas has in place an admissions policy under which most applicants who are top high school students from within the state are guaranteed admission. This policy is known as the Top 10 Percent program. The court case stems from a second part of the admissions program that says, for the remaining students from within the state who do not fall under the Top 10 Percent Program, the University of Texas considers race, among other factors, when deciding if the school will admit an applicant. A white woman named Abigail Fisher, who was denied entry to the school for the fall of 2008, challenged the university’s affirmative action program. Affirmative action is a policy under which racial minorities are given preference for education and employment opportunities based on their race. Fisher claimed that the policy was unfair because black applicants with lower grades and lower test scores were admitted while her application was rejected. She argued that the admissions program violated the Constitution’s guarantee of equal protection under the law. The case, Fischer v. University of Texas, made it all the way to the Supreme Court in 2013, when the court did not rule on the program’s constitutionality but instead ordered the appeals court to scrutinize the case more closely. Fischer’s lawsuit made it back to the high court this year, and this time the justices ruled in favor of the the university’s program. "A university is in large part defined by those intangible ‘qualities which are incapable of objective measurement but which make for greatness,’" Kennedy wrote in his opinion, quoting from a past desegregation case. "Considerable deference is owed to a university in defining those intangible characteristics, like student body diversity, that are central to its identity and educational mission." He added, "The university has thus met its burden of showing that the admissions policy it used … was narrowly tailored." Samuel Alito read his dissent from the bench, telling his colleagues, "This is affirmative action gone berserk," adding that the court’s decision "is simply wrong" and misguided. Clarence Thomas reaffirmed in his own dissent his belief that the Constitution bars any use of race in university admissions. The outcome of this case was altered by the absence of the late Justice Antonin Scalia, who died in February and staunchly opposed affirmative action programs. Fischer, now 26, attended Louisiana State University and graduated in 2012. She now works as a financial analyst in Austin, Texas, and said she continued pursuing the case to help others in a similar position. "I am disappointed that the Supreme Court has ruled that students applying to the University of Texas can be treated differently because of their race or ethnicity. I hope that the nation will one day move beyond affirmative action," Fisher said in a statement. The Supreme court decided in 2003 that it was permissible to consider race as one factor among many for college admission, and it set a goal of getting rid of affirmative action programs in 25 years. This entry was posted in Issues and tagged Affirmative Action, Supreme Court, Texas, University. Bookmark the permalink.